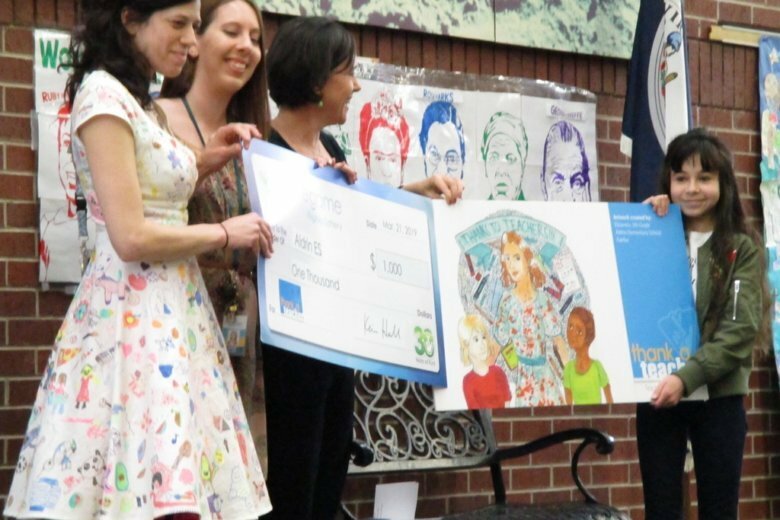 Jennifer Mullen, the public affairs and community relations manager at Virginia Lottery, told the students that the lottery started the artwork contest last year as an addition to its notecard writing to thank teachers during Teacher Appreciation Week. Three students’ pieces were selected from 700 entries, Mullen said. The Virginia Lottery presented Elizaveta with a $150 gift card along with $1,000 for Aldrin’s art department. Elizaveta’s original design will be used on thousands of thank you notes that will be distributed to public school teachers in Virginia during National Teacher Appreciation Week in May. Wolfe facilitated a Q&A between Elizaveta and her classmates, who asked questions about her favorite color (“blazer blue and red”), how long it took to make the art (“one to two hours”) and who told her about the contest (her mom). The other two winners have not been announced yet.